Sponges, dowels, pool toys, chairs, marking tape, paperbacks, trellises: these odds and ends are the stuff of dusty stacks in overstuffed garages, but to Olga Lah, these commonplace objects are the building blocks of poetic installations. 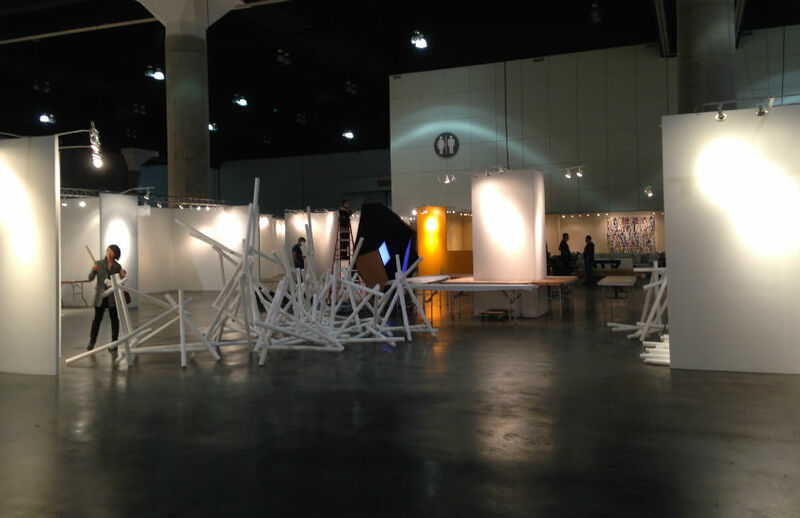 At the LA Art Show this week, the Long Beach artist will unveil a brand-new feature installation for the Korea Arts Foundation of America, which chose her as the 2014 winner of their prestigious biannual award. Dollar stores, Home Depot, and the Gardena nonprofit Trash For Teaching (which sells bulk materials for a dollar a pound) are where Lah finds both inspiration and practical solutions for her dazzling and immersive installations. 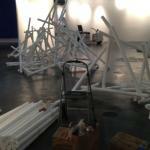 By nature impermanent and fleeting, installation art exists only as long as the space allows and is subject to the constant changes: time of day, light, audience. These qualities make it a natural match with Lah’s expansive subject, meditations on spirituality and the notion of the soul, a focus she developed growing up in the South Bay, where church was at the center of the artist’s Korean immigrant family’s social life. In addition to the KAFA Award, Lah’s work has been honored with awards from the Arts Council for Long Beach, the Art of Now International Competition, and residencies in Italy and Slovenia—so now is the perfect time to check out the soaring work of this hometown artist. 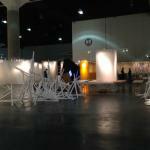 Check out Olga Lah’s installation at LA Art Show, located in Section D4/E4 of the L.A. Convention Center, starting tomorrow.